What was interesting about the process of writing about this book was reading all the reviews on Goodreads. Some of the reviewers are Mormons and some are not. Some people like the book, some do not. But, the main complaint about the book that I can see is that the novel does not accurately depict Mormonism. This is a big part of the book, of course, and, not knowing a lot about Mormonism, I found this to be interesting reading. I can also appreciate that everyone will have their own experience and opinions of their own religions, so it doesn’t surprise me that the author’s may differ from others. I’m interested to hear what Emily will have to say about this part of the book. The complaint, though, that there are too many misogynists in the book compared to real life doesn’t make sense to me, since this is a mystery novel and crimes have been committed by bad people. So, there will naturally be more bad guys in the book than you might ordinarily come across in life. And, I think we are smart enough to know that this one book and story doesn’t represent everyone and everything in the entire Mormon community. The same goes for a book about any time, place, or community of people. Another interesting thing about the book is that it is inspired by the true crime of the disappearance of Susan Cox Powell. The scary thing about this story is how happy they all look in their family photograph. It reminds us of the fact that we can never know what goes on behind closed doors. So many temples, where only good thoughts and Godliness were supposed to be, and so much horror in the real world around them. What did I think of the book? For the most part, I enjoyed it. It was fun reading a mystery – I don’t do it very often. I liked reading about the Mormon community. I liked that the bishop and his wife had a happy marriage. But, I did find the book a bit slow, like maybe there was too much packed into it. There were actually two mysteries going on side-by-side, and it was the bishop’s wife, Linda, who was trying to figure out what was going on. Since this is not her job in any way, and she was just the neighbour, there were big chunks of time when she was just thinking about everything; what her thoughts were on any new information she had discovered, what she could do to move things forward, and how it all related back to her and her own life. She also spent a lot of time in the book just being a wife, mother, friend, and neighbour – ordinary life-type things. I liked a lot of this, but if you are expecting to be reading a mystery, you might not want all these other things in your book. Mystery readers, what do you think? The main mystery I found to be quite compelling, but the secondary one seemed more far-fetched, and I’m not really sure if it was needed. I found the protagonist, Linda, to be likable enough, and I liked that she was middle-aged and in a transitional time in her life. But, sometimes she got on my nerves with all her patience and goodness, talk about grief, and how kind and good her husband is (even though he was kind and good). I tried for a moment to dial back my revulsion for Alex Helm, to feel sympathy for him. Maybe his childhood had been terrible. Maybe his mother had been manipulative and selfish, as he seemed to think all women were. But here he was now, a grown man, a father and a grandfather. And he was looking at me like I was dancing with seven veils in front of him, ready to seduce him and then suffocate him while he struggled to escape from the hell of my clutches. If you are looking for a fast-paced mystery, then you will not find it in this book. But, if you are interested in delving a little deeper into life, religion, feminism, and family with your mystery then you might find this book interesting. 1. 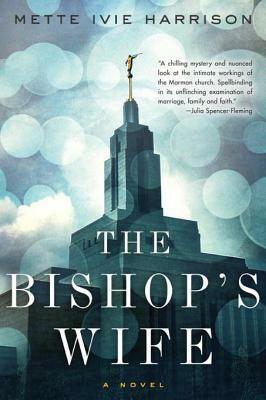 The Bishop’s Wife focused mainly on wives in the Mormon religion. The author makes it clear near the beginning of the book that Mormon men have authority over Mormon women. Men only are allowed to fill the positions of power in the church, and the women are encouraged to be home with their children. Even the kindest men in the church had no idea of the many ways in which they made their wives and daughters into lesser persons than their sons and fellow male church members. “I wouldn’t be where I am today without my wife,” they say in testimony meetings. But what they are also saying is that their wives have given up their personal ambitions in favor of the ambitions of their husbands. Mormon men protect their daughters, but they encourage and cheer on their sons. A shocking part in the book for me was when Linda went away for a few days to “nurse” her son and daughter-in-law when they had the flu. It was bad enough that Linda had made casseroles ahead of time so that her husband and son would have good meals to eat while she was gone (for 2 whole days – gasp! ), but then she commented that they probably wouldn’t even need them since the Relief Society would likely bring them food to eat while she was gone. I would feel humiliated if the Relief Society wasted it’s time and effort on my perfectly capable husband and teenage son, rather than on someone truly in need of their help. It was just a couple of days! Surely, they could fry up some eggs. 2. Linda, herself, struggled with the roles of women in her community. I liked her for this. She was happily married without any big regrets about her life, but she was able to see things for what they were and didn’t always like them. I am a happily married woman, myself, but I acknowledge marriage can be a dangerous covenant. When both people are honest and good, it is still difficult to live together so intimately, day in and day out. But no one is perfectly good or honest. And so marriage becomes a dance over hot coals and metal spikes. We contort ourselves trying to disguise one habit or another, trying to pretend to love one part or another of our partner’s that we don’t. All so that we can get along. For the most part, Linda didn’t seem to mind her role as a stay-at-home mother. She seemed to get satisfaction out of taking care of her house and family. However, I think the stage of her life was making her feel restless, like she wanted more for herself at this point. She also had some issues with her “duties” as the bishop’s wife. I think she was frustrated that she didn’t have more power to help people who needed it. She had to always defer to her husband, the bishop. “Making bread, going on visits with the bishop, and changing minds slowly.” As I said the words, I felt keenly how small of a job it was. I was the bishop’s wife. I wasn’t in charge of anything but making the bishop dinner, not officially. Being the bishop’s wife wasn’t an excuse for having no life of my own. Mette Ivie Harrison, herself, is a practising Mormon with a long list of achievements; she holds a PhD in Germanic Languages and Literatures, she has written many books, she is a nationally ranked triathlete, and not least of all a mother of 5. You made some good points about Linda’s life that I didn’t pay much attention to! I just was looking at it as a different way of life and figuring she would do things I would never do (like make my husband meals for when I was gone–although I know some women do that). I think it’s interesting that both you and Emily seemed to see Linda’s marriage as less positive than I did. I did think she had a good marriage (as good as most people get, actually), but she also obviously had some of her own ideas that didn’t necessarily always go along with what she was supposed to think. I felt like she wished she had more power/authority to be able to make more of a real difference in people’s lives. Luckily, for her, though, she also seemed to be the type of person who was content to be a homemaker; she got satisfaction from it. If she had been a different personality, there could have been a lot more conflict in her marriage, and more unhappiness for her. Their biggest obstacle seemed to be the grief over their lost daughter, but we all have something to be worked out. Nobody’s marriage can be perfect. Oh, gosh, I wrote an entire answer to you and then accidentally lost it. 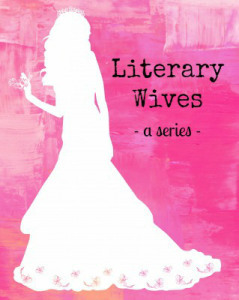 I think this novel was more thoughtful, too, in exploring the role of wife. Anna and Tobias’s relationship bugged me, too, but I didn’t want to get into the details too much for fear of revealing important plot points. But it bothered me that, sealing being so important to them, he refused to seal with her. In fact, he made it clear all along that his first wife was more important to him than she was. The sealing part just emphasizes that. Did anyone besides me miss this? (Spoiler) Having found his first wife in the garden, how did they know he didn’t kill her? After all, a person could be just as obsessed by a murdered first wife as by just a dead one. Did I just forget what they said about this? (Spoiler) I think that, at first, they did think that he had killed her, but not much was being done about it, because Tobias was already dead. Then, later on, his older son (Liam?) told Anna about his memory of the grandfather coming to visit and there being a fight downstairs, and he indicated somehow that it was her father that had struck the deadly blow, not Tobias. I think we are meant to go with this story as the one that really happened, but I don’t think there was ever any proof of it. It did make Anna feel better about her late husband, though. Oh, that was it. Still, it seems like they would have exhumed her and had an investigation, but they didn’t. Or, they might have exhumed her. I already don’t remember. Anyway, I thought it was unlikely that it would have gone no farther. I think Liam wrote what he remembered down, so that Anna would have the chance to take it to the police if she wanted. But, I think she was just happy to have it figured out. I don’t think we know what she did in the end. I remembered being a little confused about that shortly after I finished the book. It seemed like they would have to go to the police. In fact, I couldn’t figure out how he could get away with not doing something officially with his wife’s body after everyone knew she had died. It was kind of strange, and didn’t seem very realistic, which is one of the reasons why I could have done without this particular storyline. Yeah, I don’t see how they could get away with keeping it to themselves, either the death or the body. I love your review! You covered all of the good and “bad” aspects of the book. I especially like how you interrogate this as a mystery novel. I agree that there were too many story lines. I could’ve done without Anna and Tobias. I didn’t know what to think – I don’t read mystery novels very often, but I could see why someone might not think it fast-paced enough to be considered one. It worked for me, though, because I don’t need a novel to be fast-paced to enjoy it. And, I love reading about other religions, so that was a plus for me, too! If you haven’t read the Goodreads reviews, you might want to check them out. I had almost as much fun reading what other people thought of the book, than reading the book itself. It also made me think more about what I had read, and whether or not I agreed with what people were saying. I don’t know what it was about Anna and Tobias, but I didn’t enjoy that storyline much at all. I’m wondering if it’s main reason for being there was to talk more about the sealing customs (which I did find interesting, but have to admit, am glad that I don’t have to contend with it in my own life). Hi Lynn! I still can’t see that your responses have shown up. Can you see them?